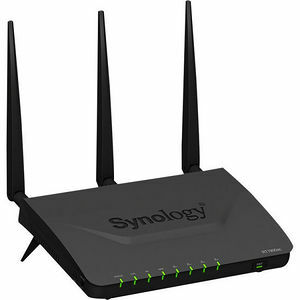 Synology Router RT1900ac is a high-speed wireless router designed for homes and offices. The latest wireless technologies provide swift and reliable Wi-Fi connectivity. The revolutionary software experience is incredibly intuitive even for non-techy people. And advanced management tools enable power users to fine-tune the flow of data in the network. Equipped with three powerful antennas and support for the latest 802.11ac wireless networking standard, Synology Router RT1900ac broadcasts both 2.4 and 5 GHz spectrums for combined data transfer speeds of up to 1900 Mbps . Never worry about speed bottlenecks even when multiple people are connected to the network. Take advantage of easy-to-use bandwidth prioritization and network traffic controls, so your games always get the speed and low latency they need. Enjoy buffer-free playback when streaming 4K movies from your favorite online video service, or play home videos stored on external storage directly on a DLNA compatible TV or media player. Share important files and documents quickly and smoothly when collaborating with business partners or others. Traditional routers broadcast wireless signals in all directions, regardless of the position of your laptop or smartphone. With smart Beamforming technology, Synology Router RT1900ac focuses wireless signals toward up to six supported devices, reducing latency, economizing power consumption, and improving wireless range. Synology Router Manager (SRM) is the operating system that powers the Synology Router RT1900ac. With the friendly interface, it makes managing your network and Wi-Fi settings super simple, while delivering robust tools for power users and professionals. When first setting up Synology Routers RT1900ac, simply plug it into your existing ISP modem, enter "router.synology.com" in a web browser, and follow the interactive installation guide to finish. You can also install DS router to find and complete setup using your Android or iOS device. Synology Router Manager (SRM) includes advanced traffic tools that surpass the common router. With the Network Center application, you can limit bandwidth consumption, block malicious content, and fine-tune how data travels through your home or office network. Powered by a deep packet inspection engine, Application Layer QoS (Quality of Service) lets you see how much bandwidth is consumed by individual applications and devices. If someone is hogging too much bandwidth on non-essential applications - like YouTube or Spotify - you can restrict the amount of bandwidth the device can use for the specific application, without affecting the bandwidth available for other applications. For parents or business owners, you can easily set a schedule to control when children or employees are allowed to access the Internet. In addition, with a vast database of dangerous or inappropriate websites built into SRM, you can customize what kinds of content is permitted and effectively block thousands of sites with a few simple clicks.